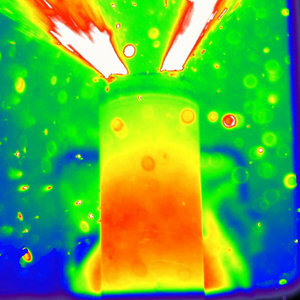 What happens when lithium-ion batteries overheat and explode has been tracked inside and out for the first time by a UCL-led team using sophisticated 3D imaging. Understanding how Li-ion batteries fail and potentially cause a dangerous chain reaction of events is important for improving their design to make them safer to use and transport, say the scientists behind the study. Hundreds of millions of these rechargeable batteries are manufactured and transported each year as they are integral to modern living, powering mobile phones, laptops, cars and planes. Although battery failure is rare, earlier this year, three airlines announced they will no longer carry bulk shipments of lithium-ion batteries in their cargo planes after the US Federal Aviation Administration tests found overheating batteries could cause major fires. The study by UCL, ESRF The European Synchrotron, Imperial College London and the National Physical Laboratory, published in Nature Communications today, shows for the first time how internal structural damage to batteries evolves in real-time, and provides an indication of how this can spread to neighbouring batteries. First author, UCL PhD student Donal Finegan (UCL Chemical Engineering), said: "We combined high energy synchrotron X-rays and thermal imaging to map changes to the internal structure and external temperature of two types of Li-ion batteries as we exposed them to extreme levels of heat. We needed exceptionally high speed imaging to capture 'thermal runaway' - where the battery overheats and can ignite. This was achieved at the ESRF beamline ID15A where 3D images can be captured in fractions of a second thanks to the very high photon flux and high speed imaging detector." We pushed the batteries a long way to make them fail by exposing them to conditions well outside the recommended safe operating window. This was crucial for us to better understand how battery failure initiates and spreads. Hopefully from using our method, the design of safety features of batteries can be evaluated and improved. Previously, X-ray computed tomography (CT) had only been used to analyse battery failure mechanisms post-mortem with static images and to monitor changes to batteries under normal operating conditions. In contrast, the battery without an internal support exploded causing the entire cap of the battery to detach and its contents to eject. Prior to thermal runaway, the tightly packed core collapsed, increasing the risk of severe internal short circuits and damage to neighbouring objects. Corresponding author, Dr Paul Shearing (UCL Chemical Engineering), said: "Although we only studied two commercial batteries, our results show how useful our method is in tracking battery damage in 3D and in real-time. The destruction we saw is very unlikely to happen under normal conditions as we pushed the batteries a long way to make them fail by exposing them to conditions well outside the recommended safe operating window. This was crucial for us to better understand how battery failure initiates and spreads. Hopefully from using our method, the design of safety features of batteries can be evaluated and improved." The team now plan to study what happens with a larger sample size of batteries and in particular, they will investigate what changes at a microscopic level cause widespread battery failure. This study was funded by the Royal Academy of Engineering, Engineering and Physical Sciences Research Council (EPSRC) and National Physical Laboratory. The 'beam time' to conduct these experiments was provided by the ESRF.